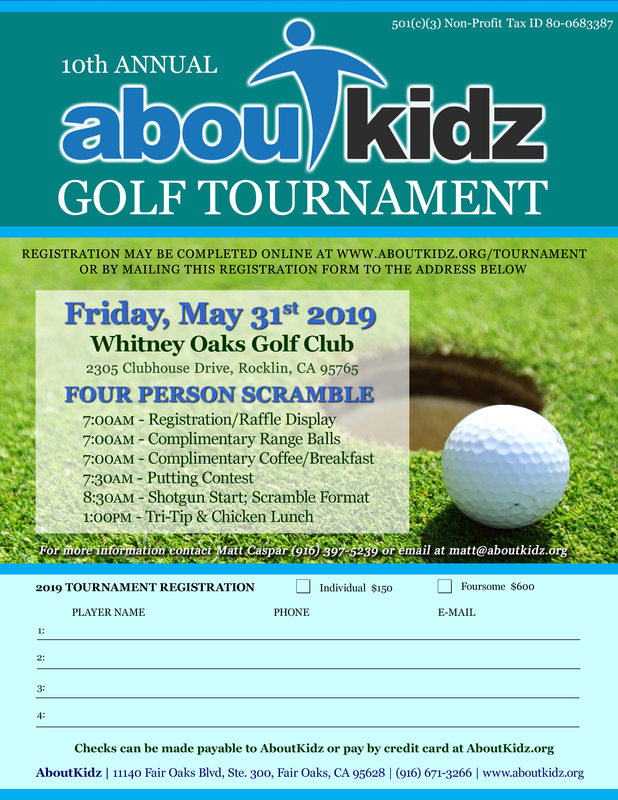 Registration for the 10th Annual AboutKidz Golf Tournament is NOW OPEN! The tournament will be held on Friday, May 31st. The format is a four person scramble. Registration and driving range open at 7:00 AM. Putting contest begins at 7:30 AM. The tournament's shotgun start will be at 8:30 AM. Tri-Tip & Chicken Lunch begins at 1:30 PM. Raffle & auction prizes available during the luncheon. Whitney Oaks Golf Club in Rocklin. Information about sponsorship opportunities is listed below. Register online using the form below and then pay by credit card using PayPal with the button below the registration form on this page. You can also mail your registration form with a check made out to AboutKidz to the address at the very bottom of this page. Registration is $150 per player or $600 for a foursome. Click on the "TOURNAMENT PAYMENT" button below to pay for your registration by credit card using a secure PayPal link. You can use this same link to make a donation and become a tournament sponsor. First Day provides the opportunity for more than 1,000 low-income and at-risk children to begin their school year with confidence and enthusiasm. Our First Day event has a festive atmosphere with lots of games and activities for the whole family. Each registered child that attends the First Day event receives a backpack filled with school supplies, a haircut from a licensed professional, and a new outfit of shirt, pants, and shoes. Each family in attendance receives a bag of non-perishable food items to take home with them after the event. Click on the image to the left to become a tournament sponsor!